This is the panel that Brunelleschi submitted to the Florence competition for the doors of the baptistery of the Cathedral. 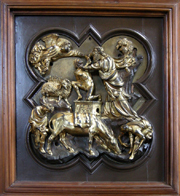 The competition was won by Ghiberti. Brunelleschi, Filippo, 1377-1446. Sacrifice of Isaac, from Art in the Christian Tradition, a project of the Vanderbilt Divinity Library, Nashville, TN. http://diglib.library.vanderbilt.edu/act-imagelink.pl?RC=54825 [retrieved April 24, 2019]. Original source: http://commons.wikimedia.org/wiki/File:Abraham_und_Isaak.JPG.